Calvin L. Smith: Giving up land for peace? I would say that our task is to preach the Gospel, not re-establish the kingdom - as per Acts 1. The borders of Israel are in God's hands, their souls are in ours. An Israeli who dies today without Jesus goes to hell - that must be our priority. That stated, the question is an important one. Note that Abraham divided the land with Lot for peace, a good precedent, and that God then appeared to him (Genesis 13:14-17)and re-promised the whole land to him. Abraham did not take God's original promise as being opposed to him showing Godly mercy, meekness or kindness, and God honored him for this. We can trust in God and do right, rather than trying to do God's will in our own strength - thats how Abraham got Ishmael! Again, God did not appear to Abraham after he gave away half the land for peace and tell him off, curse him for despising his promise or something - rather, he confirmed it - as if to say, well done, you acted correctly and sought peace, therefore I am glad to promise yet again that in the future, I will give you all this. Clearly, the decision is not ours to take, its not our lives at risk, or our kids in uniform, but if genuine peace were offered, and I agree that is a big if, then I think God would be proud of Israel for making painful concessions for peace. I like that they accepted the compromises offered in 47, 48 etc, and offered their own more recently. I am glad they were not the ones who issued the three nos - no peace, no recognition, no trade. I see the cfi.org.uk intouch raises the same questions in one item and quotes from your book Calvin. The question I would raise though is how do we interpret the concept of land in the new covenant where all things are being brought together in the Messiah. i.e. an interpretation of land where the promised Land of Canaan is seen as part of the whole of creation (Romans 8 19-21) and where Jews and Gentiles are being brought together in Christ (Eph 2:11-22). Matt 28 18-20 says this "Then Jesus came to them and said, "All authority in heaven and on earth has been given to me. 19Therefore go and make disciples of all nations, baptizing them in the name of the Father and of the Son and of the Holy Spirit, 20and teaching them to obey everything I have commanded you. And surely I am with you always, to the very end of the age." "
I guess it is whether we see Israel as an 'ethnos.' I am informed that ethnos may include Jews as well as Gentiles and was used in the same way we use the word 'ethnic' i.e. all have an ethnic identity, Jews and Gentiles alike. In light of this Biblical mandate, I am not sure borders are that important from a theological perspective - I can envisage a single confederate state solution for instance, but the question is whether we are seeking to build Messiah's Kingdom in Gaza, the West Bank, in the State of Israel, and in the world. I believe that the Bible teaches that the Holy Land has been extended to cover the whole earth, and that God is bringing Jews and Gentiles together in Christ - in the land and in the world. I wonder as well whether the experience of Jews mirrors Abraham's. Abraham was called out of Ur to be a blessing to all nations - and he never went back to Ur as far as I can see because of God's calling. (The presence of God in the Tabernacle moved from Shiloh to Jerusalem, and now to the New Jerusalem in Jesus). So I would argue that Jews can re-enter the 'land' whereever they are in and through the Messiah. What this means is that Jews need to feel welcome in all nations, and that Jews and non-Jews need to feel welcome in Palestine. just a thought, would it be possible to ask your panelists to explain and defend their views on this question on your blog, by joining in this discussion? The Bible is not a geopolitical textbook. It's the last word on all matters of faith and conduct. It tells us what God is like, how he dealt with his people, and how he will deal with us now and in the future. It tells us of his faithfulness, love, mercy and anger. It gives us commands for how to live in the future. It does not tell us what the boundaries of the world's states should be. It does not endorse the UN charter or reject it. It tells us to oppose those who in their power oppress the weak. It tells us to follow God's moral codes. And it tells us to make disciples of people from every nation, tribe and tongue. So if you ask whether there is a Biblical problem with giving up land for peace? As much as it would be nice if the Bible told us all about international diplomacy, it simply doesn't. So I don't see the need to second-guess God's will. Hmmm. Not sure I fully agree with you there, Philip. Certainly, the Bible should not be read as an ongoing commentary on world news in Hal Lindsay style, which is folly. But your limiting the Bible to an ethical reading only is equally problematic. God, who exists outside time and space, works through history. Indeed this is the whole essence of the Incarnation, that God through Christ enters time and space, working through history, to reach and communicate to us as humans (hence, Jesus is the Word of God, ie His message to us through history). This is why the historical events such as the Incarnation, Passion and resurrection are so central to Christianity (and why the old Bishop of Durham got it so wrong when he denied their importance). It also explains why Christianity and communism are so diammetrically opposed, because both have rival understandings of history and their role within it. So history is important to God. Indeed, He has revealed Himself through it. It is not surprising, then, that the nations and human history as a whole are equally important to God. (Going to continue on to a new comment below, as space is limited here). Indeeed, the Bible is replete with references to the nations (type the phrase in any commentary and it comes up several hundred times), while God's dealings with His people Israel in the Old Testament are inextricably intertwinned with the surrounding nations. Neither is God's dealings with the nations limited to the OT, while eschatologically this theme takes centre stage once again. After all, how can it not? If the whole essence of Jesus' teaching is the inauguration of the Kingdom of God in His day, yet brought about in its very real fullness utilising a war motif during the parousia when He returns as conquering King, how can God not not take an interest in the affairs of nations? So with respect, I disagree with your purely ethical approach to biblical interpretation. The Bible is thoroughly eschatological, and this element is totally missing from a purely ethical interpretation of Scripture. And lest you think it is only dispensationalists who focus on the eschatological aspect of the Bible, this is quite incorrect. After all, if the Church no longer holds to its great eschatological hope, what is the point? I haven't even got on to the biblical case for arguing God retains a plan and purpose for the Jewish people, which, if true, surely has some bearing on how we view and respond to events in the Middle East. You may not agree with scholars who hold such views, but they count among them some of the most brilliant scholars, respected among (if not agreed with) their peers. Hence my original question to those who hold such views, namely, if, despite holding such a view are there biblical and theological reasons why they cannot concede the concept of land for peace? I fully agree that God has acted through, reveealed himself through, and has been interested in history. But just as, in the past, God spoke in many ways but today he speaks through his Son, today, I don't believe that he is interested in geopolitics, except insofar as he wants the Gospel proclaimed to the nations, and he wants his people to be one, united. So with respect, doing a search as to how many times the word 'nations' appears in the Bible is a bit of a red-herring, because what counts is not how many times we can find the word, but rather the way in which it's used. The whole point of the Kingdom of God is its difference from oher kingdoms of this world (in a similar way, I would note, as Israel was to be different from those nations around it). God's Kingdom is multinational, multilingual, multiracial, etc. It has no national boundaries. There is a clear divide between before and after Christ. While in the past God may have directed geopolitics (and today he still does, in his sovereign will, of course) today his plan for his people does not involve it. His commands to us are as I outlined above. So your question about land for peace should rather be framed in those terms. Its impact on the oppression of the weak, its implications for the Gospel of Christ and its impact on the Godliness of God's people. "Just as, in the past, God spoke in many ways but today he speaks through his Son, today, I don't believe that he is interested in geopolitics..."
Not sure I follow this reasoning. How does the manner in which God reveals Himself determine that He is no longer interested in geopolitics? "Doing a search as to how many times the word 'nations' appears in the Bible is a bit of a red-herring, because what counts is not how many times we can find the word, but rather the way in which it's used." You were rather condescending there (pity). I didn't say "nations" or vacuously suggest simply looking up the number of times it appears. Rather, I referred to "the nations", a biblical theology theme (much like, say, "the day of the Lord") which has a particular meaning and usage, whether pre- or post- Christ. I therefore still eagerly await your response to this point. "Today his plan for his people does not involve it [geopolitics]". There you go again. How can you be so dogmatically certain? Rom 13:1 and Col 1:16 seems to suggest otherwise, as do the eschatological references to "the nations" (which you haven't commented on yet). Indeed, I'm not sure you really believe it yourself, otherwise why expend so much energy criticising Israel on faith grounds? "God's Kingdom is multinational, multilingual, multiracial, etc. It has no national boundaries." No one would dispute this. But the spiritualisation and broadening of the Kingdom in no way negates either its literal outworking, or the promises bestowed to Israel. Cue Darrell Bock's paper at the conference, which discusses this very issue. Which brings me, finally, to the continued calling of the Jewish people, so important because it has direct geopolitical importance if they remain His people. (You use the term "his people" in the last paragraph to mean only Christians, but what if it also means His historical people?") Thus, it surely has a bearing on how Christian Zionists respond to the land issue, hence my original question aimed at challenging them. My point was less that there is no literal outworking of the spiritualisation of the Kingdom of God in the real world, but rather that God does not tell us how this will occur and therefore, for us to try to influence it in the way that we think he would want us to act is, in my view, wrong. God has given us a manual on what we are to do in the end times, and it does not include a 'how-to' for Ban Ki Moon. God undoubtedly has a plan which will work itself out in terms of the nations, states, rulers, tribes, etc. of this world, as Col 1.16 makes clear. And we will see that plan unfold as time passes. My point is that he gives us no clue as to what that plan is. So rather than speculate as to what it is, it's my view that we should get on with those things that it's clear from the Bible that we should do. I'll happily respond to your point about the nations, but so far, I have to say I don't understand what it is. You haven't actually tod us what you think the eschatological meaning of the term 'the nations' actually is. When I use the term God's 'people' I don't in fact mean only modern Christians. True, in modern terms, it refers to those who have placed their trust in Christ as Saviour and Lord. However, the church is an extension of God's historical people, and therefore the phrase, when used in the context of time, is inclusive in that sense. Eschatologically "the nations" are presented in much the same way as dealt with by God in the OT within the context of His dealings with Israel. Your first para of the last comment seems to indicate I am arguing we should be involved in drawing maps and borders. But I'm on record saying the complete opposite (it is God who decides). I honestly think you may have missed the point of what I am getting at here. Indeed I am asking if some pro-Israel Christians need to think through whether objecting to land for peace is as theologically problematic as some of them assume. In your last comment you raise a point I want to take further. You seem to acknowledge the "people of God" also encompasses His historical people. Doesn't this, then, have an impact on how we view the Jewish state? We can discuss (indeed agree on some issues concerning) justice within a Middle East context. But beyond that, if you acknowledge the Jewish people remain God's people, doesn't this, by its very nature, have an important bearing on and demand a particular Christian response to the Jewish state? It doesn't mean endorsing it, accepting its secular politicians, turning a blind eye to aspects of its behaviour we may find unacceptable, or whatever. But a Jewish state comprising a Jewish people who remain the people of God surely means viewing and responding to it in a particular way, don't you think, just like we should pray for and stand by, say, 50 million Christians opressed in China, Christians in the Sudan, and indeed Palestinian Christians. In short, I'd be interested to know if you truly believe God retains a plan and purpose for the Jewish people as a corporate entity, because if you do, then this changes the whole direction of the debate. 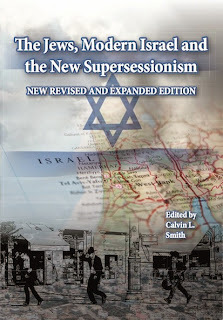 The issue then becomes one of how we, as Christiasn who reject supercessionism, can set about defending that doctrinal position and praying for the Jewish people and state without embracing an ultra-Christian Zionist position of staunch defence for Israel no matter what. If you don't believe that it's for us to draw borders on maps, then surely the answer to the question, can Israel give up land for peace, is obvious. It really doesn't matter! God will take care of whatever is supposed to happen. Christians should be concerned about the imperatives I mentioned above. I don't believe that God retains a plan for the Jewish people separate from the rest of God's people. The remant of Israel and modern believers are all part of the same people. All are saved by faith in Christ as Saviour and Lord, and by nothing else. However, even if I were to agree with you and believe that God retains a different and separate course for Jews, I would still think has zero to do with the modern state of Israel. And even if I were to agree with you and consider that God will give the Jews a new homeland, I would simply not know whether that was the modern state of Israel or not. God, in these last days, speaks to us through his Son, by his Spirit in his Word the Bible. The Bible, as I have mentioned, does not deal in modern geopolitics. God has not told us that the modern state of Israel is his home for his chosen people. Therefore it would be wrong for us to draw the conclusion that it is. God has told us all we need to know. He did not give us a primer in Middle East politics. It is the inheritance of the children of Israel. To the other son of Abraham, Ishmael. promises were also made that 12 tribes will be born of him and he will possess much land and today Arab lands stretch far and wide and very rich in oil. while Israel is no bigger than Wales. Land for peace is a myth, recent history informs us that quite the opposite of peace ensues when the Jews give up any part of the land. As the palestinian/hamas agenda clearly states 'elimination of Israel'. Now we gentiles were drawn nigh unto the commonwealth of Israel, we who were afar off, Eph.2.12. Now we don't endorse everything the Israeli government does (all governments have elements of corruption) But neither do we try to delegitimize it! A little less anti-Judaism in the church would not go amiss and let us remember Paul's words in Rom,9.1-5. I think the Bible does deal with geopolitics Phillip, although ultimately if God has made 'one new man' between Jews and Gentiles (Ephesians 2) then ethnic identity should not be an issue with who has majority control of a state. Are we as Christians not heralds of God's Kingdom on earth to make disciples of all nations (ethnos), even to redeem the whole of creation? That to me is a very political message and we should speak prophetically into political situations. It is questionable though whether Christians should engage in political manipulation that may look no different to worldy politics that denies the grace of God. But just as Elijah spoke to Ahab and Jezabaal so too Christians should speak prophetically to the modern State of Israel. (Tom Wright's books Surprised by Hope and Justification explain the gospel in broader terms involving God's Abrahamic plan for the world through Israel and the Messiah. He rejects supercessionism and Christian Zionism seeing the Abrahamic covenant being fulfilled in the Church as Israel). On the other side, Romans 11:28 clearly says that Jews are loved on account of the Patriarchs (a message Paul gets from the OT, Hosea etc) but surely we need to be careful when turning that into saying Jews are God's people today apart from Christ, or to linking it to legitimising a Jewish State. In what sense is this meant? Hosea says that even in divorce Jews will be loved and brought back into covenant relationship with repentance, but I just don't see evidence of that in the State of Israel today. Perhaps revival will come to that land amongst Jews (something I pray for), but if that occurs it will surely collapse the importance of having an identifiable Jewish State in light of Ephesians 2. There is nothing wrong with maintaining a Jewish cultural identity in a Messianic-right sense in the land, but I would ask whether the need to have a majority Jewish state is problematic if looked at from a political-ethnic or religious dimension? Is Jewishness then primarily ethnic or religious? !5 May 1948 the U.N Legally recognized Israel. There are Mizrahi Jews from Africa, Sephardi Jews from Spain and Salonika from 1492. Romaniote Jews from Jannina in Greece who migrated at the same time as the spread of Christianity. Ashkenazi Jews from Europe, atheists and religious, Indian and Chinese Jews and more that would require a book. Yes, the christian has an 'Elijah calling' but don't single out Israel for this 'righteous indignation' and ignore real criminals and tyrants, don't wish to name anyone in particular but I can think of many that need an 'Elijah warning'. Claiming 'Abrahamic covenant fulfilled by church as Israel' is supersessionism or whatever name one wishes to call the robbing of Israel's birthright. 'Paul gets his message from O.T' ??? It is all the Word of God! He chose the Jews, God has not revoked that calling. Messiah will return to Jerusalem, they will recognize Him, it's hardly speaking to christians. Eph 2: There are still Jews and gentiles, men and women, distinctions will always remain, we don't merge into one homogenous blob. Incidentally, reading 1 Kings 21 Ahab and Jezabel stole the birthright inheritance of Naboth in Jezreel after they murdered him. When exposed by Elijah Ahab repented. I wonder to what extent this is a metaphor for today's situation in the middle east? The only people doing any stealing of birthright are the replacement of Israel with the church theologians and all who subscribe to their teaching. And Islamists who would like nothing better than the destruction of Israel. Chris - the Old Testament narrative about Israel is more complex than Christian Zionists teach. I posted a longer piece earlier, but it got lost. A question - does Judah have the birthright? Judah has the kingship, Levi had the Priestly role - until Christ (Melkizedek) came. 1 Chron. 5 1-2 """1 The sons of Reuben the firstborn of Israel (he was the firstborn, but when he defiled his father's marriage bed, his rights as firstborn were given to the sons of Joseph son of Israel; so he could not be listed in the genealogical record in accordance with his birthright, 2 and though Judah was the strongest of his brothers and a ruler came from him, the rights of the firstborn belonged to Joseph)- """
Chris, you seem to confuse different covenants (Abrahamic, Mosaic, Davidic, New) and assume that they are all the same, with the same details, and that all are still current. That's simply not the case. In fact, the Abrahamic covenant was not a convenant to Jews only. God promised to make Abraham's decendents a great nation. But the New Testament makes clear that Christians too are Abraham's children. THe promises to Abraham were and are not for the Jews only. And certainly not in the same way as the Mosaic covenant was for the Jews only. Andrew, the Bible is the utlimate authority for all matters of faith and conduct and so naturally as we act in situation, whether they are personal, political, social, etc. it will guide our actions as Christians. But what I mean is that those who say that they think Israel (the modern state) is somehow a representation of God's will and / or people are, in my view, wrong in two ways. First they say that it's possible to know something with certainty that is not told to us in the Bible. Well, simply put, God has promised to speak to us through his word and in no other way, so we shouldn't expect knowledge to come from elsewhere. So we simply can't say that modern Israel is a reconstiution of God's people. Second, they are wrong because they are becoming involved in the political machinations of this world, which is fine to do as a hobby, but not in an 'official Christian' way. Finally, the burden of proof is not on me. Those who argue that the Bible tells us how the world should be run today (in a political sense) must explain why they believe that to be the case, not the other way round. Whenever they see the word Israel they read 'church'. God's promises to Abraham were confirmed to Isaac (not Ishmael nor any other son) and then again to Jacob who was named Israel after he fought with the angel. Abraham married Keturah after Sarah died, and he had several more sons from Keturah, but still the promised was for Israel. I'm not surprised that replacement theology subscribers cannot see a future for Israel simply because they have imbibed the teachings of the so called 'church fathers' (call no man father) by using a method of interpretation full of metaphor and allegory, instead of taking the Word in its plain meaning, also you will find a very anti-Judaic streak in their writings in an effort to separate christianity from its Jewish origins, see 'Future Israel' by Barry E Horner, freely online. Phillip - I guess I see the gospel message of the Kingdom of God as political in a neo-Calvinist sense - the gospel is not just about bringing individuals to Christ, but about making disciples of all nations in Christ - including the State of Israel, Gaza and the West Bank. Chris - No one is usurping 'Israel' because Jesus and the discples were all Jews - Jesus had every right to claim the true birthright, kingship and priestly role of Israel from the scribes and pharisees, and to extend his rulership across the world to Jews and Gentiles thus making the whole earth the 'holy land.' All of this was according to the promised blessing of Abraham and the place of Israel is thus included in the Christian meta-narrative. I can't help thinking that some forms of extreme Christian Zionism are seeking to establish Israel apart from and instead of in Jesus Christ which to me raises alarm bells about false teaching in the Church. Andrew, I guess that I disagree with you about the 'political' sense in which nations are converted in their entireity, as opposed to the individuals that constitute them. Out of interest, what do you use to back up such a view? Chris, if you wish to use phrases such as 'usurpers of Israel's promises' and 'replacement theology subscribers' in such a pejorative way, that's fine, but it undermines your arguments somewhat. You would be better off telling us why you think the Mosaic covenant still applies, or why you think the Abrahamic covenant applies to Israel differently from gentiles. Neither Andrew nor I have argued that you should replace the word Israel wherever it occurs with the word church. Andrew, you're obviously quite right that many seem to think that Jews are saved by some means other than through Jesus. It's a great pity. Just to be clear, I know that Calvin does not hold such a view! Please don't patronize, there is only one way to salvation as John 14.6 and Acts 4.12 make perfectly clear. and at the risk of repeating myself, all those who see the word Israel and read 'Jesus' or 'the church' or anything other than Israel are usurping Israel's promises, church history clearly shows this to be the case. And what is 'alarming' is the obnoxious idea that Israel has no right to exist 'apart from Christ'. Phillip - I am not saying that nations are saved in the same way as individuals, but that saved individuals collectively transform the politics of nations in Christ. Chris Romans 2:28-29 say this. 28For he is not a Jew who is one outwardly, nor is circumcision that which is outward in the flesh. 29But he is a Jew who is one inwardly; and circumcision is that which is of the heart, by the Spirit, not by the letter; and his praise is not from men, but from God. In other words, Jewishness today is to be found only in Christ - the king of the Jews. behold, he that keepeth Israel shall neither slumber nor sleep. Psalm 121.4. I lean towards strict dispensationalism so I think the Lord will return by 2033-2070 or so and Israel is part of the plan, but I think folks get too caught up in day to day details interpreting foreshadows as birthpangs, always thinking we are closer than we are to the end. Like the Millerites, its easy to get excited about Y2K or Obama or something. Just remember God is still on the throne! LBU Grad.